For those who want to know what the Lakes Hub has achieved this year, but are in a rush, here are some quick facts. For those with more time, click on the image adjacent to download the full annual report. Lakes Hub was contacted 19,696 times (averaging 82 contacts per business day). Lake Hub staff or volunteers provided information on the Lakes and Coorong to visitors, community and government staff 11,887 times (averaging 50 instances per business day). Staff gave eight presentations to community groups and other organisations. 2,711 people visited either the Milang or Meningie Hub. Thirty-two electronic bulletins were produced and were opened by 38% of bulletin subscribers. At the end of the financial year, there were 547 people on the Bulletin subscriber list, with up to the same number accessing the bulletin though Facebook, the website and other organisations mailing lists. Lifetime likes (subscribers) on Facebook went from 133 to 290 individuals. On Facebook, there were 165,697 post impressions over the 2014/15 financial year, with each unique user being shown approximately three posts per day. There were 7,622 visits to the Lakes Hub website, peaking at 1057 visits to the website in May. March and June both had over 900 website visits. Most visits to the website included downloading the latest Bulletin. 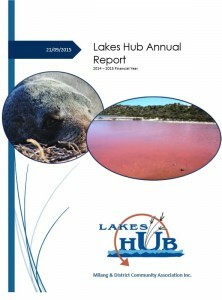 There were 14 media releases and printed-media published articles facilitated or about the Lakes Hub, along with six radio interviews organised by the Hub. Through the Bulletin and other media, Lakes Hub provided community members with information on 123 opportunities for training, learning and education. Lakes Hub ran a total of 20 events for the community, with 340 attendees. Twelve Community Nurseries Network (CNN) meetings were facilitated over the year. 30-40 local people have been employed through the CNN over the financial year, along with approximately 40 volunteers each month. Eighteen school-based events were run by the CNN coordinator. In addition during 2015/15 the Lakes Hub have completed a transition planning process, strengthened key partnerships with stakeholders such as the South Australian Murray Darling Basin and South East Natural Resources teams and the CLLMM Community Advisory Panel. This entry was posted in Community Nurseries, Coorong, DEWNR, History, LakesHub, Media releases / editorial, Meningie, Milang, Murray-Darling Basin, Reports. Bookmark the permalink.